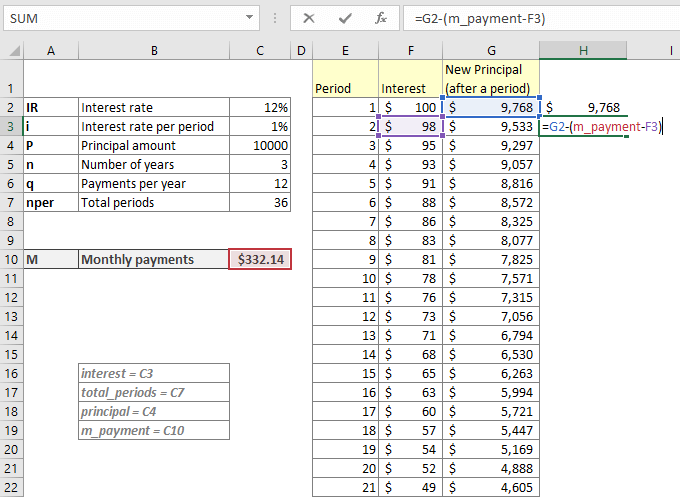 In this article, I will show you how to calculate monthly payment in Excel with some examples and criteria. You have to pay an equal amount of money at the end of every month. In this case, your first payment will be on 4th July 2018 (end of the month). In reality, most of the banks will give you some more days to pay the monthly payment. How much money (principal + interest) will you pay at the end of every month for the next 5 years? You get the answer from the above image: ($1112.22) every month. By default, the amount is shown in the negative format as it is cash outflow. 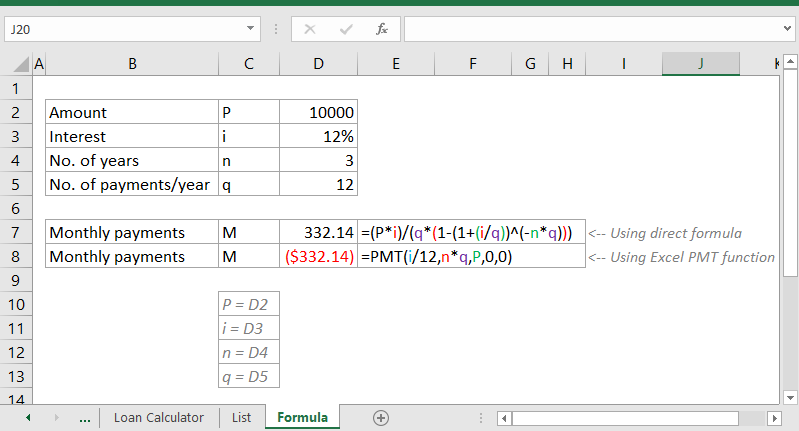 You can change it to positive by just adding a negative sign after the equal sign in the formula. And here is the result. The value is now positive. 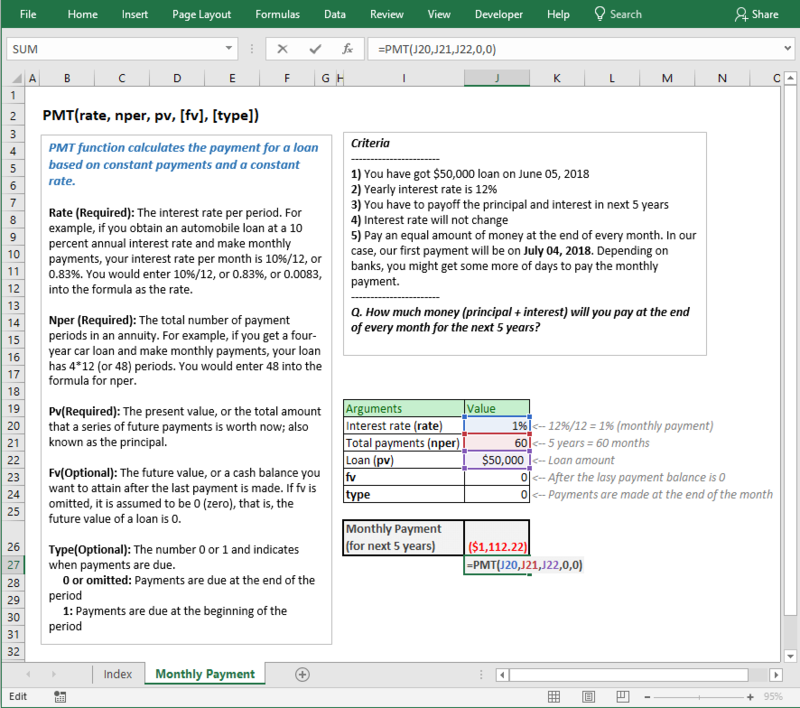 Excel’s PMT function will output you the monthly payment for these types of cases. So, let’s understand how PMT function works. 1st payment done. What happens actually? 2nd Payments done. What happens behind the scene? What if payment is done monthly but the interest rate is compounded semi-annually? So, PMT function has 5 arguments. 3 of them (rate, nper, pv) are required, and 2 of them (fv, type) are optional. rate (Required) Interest rate per period. Say, you got a loan at the yearly interest rate of 12%. Make payment monthly. Per period interest rate is 12%/12 = 1%. nper (Required) The total number of payment periods. Say, you got the above loan for next 5 years. pv (Required) The present value. Simply, it is the loan amount you receive. fv (Optional) Future value. When you will calculate the loan payment, in most cases, this value will be 0. As at the end of your last payment, there will be no balance with the bank. If you don’t use this value, PMT will assume this value as 0. 0 or omitted: When you use 0 or omit this argument it means that payments are made (or due) at the end of the period. 1: When the type is 1, it means payment will be due at the beginning of the loan period. 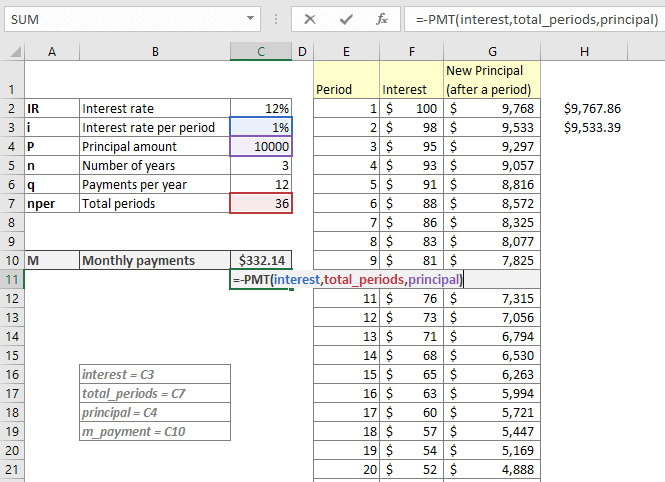 I know it is convenient to use the Excel’s PMT function to find out the monthly payments of a loan. But what if you want to know how the whole formula works behind the scene? To know more about this formula, check out this link. I will not show you how this formula has got this face after passing several phases before. What I am going to show is a clear understanding of the PMT function and its internal states. I found it enjoying when I did it. I hope you will also like it. Yearly interest rate is 12%. So, per month interest rate is 12%/12 = 1%. So, PMT function’s rate argument is 1%. Principal amount, the amount you took from the bank is $10,000. So, PMT function’s pv is 10,000. Number of years you’re getting to pay off the Principal and Interest is 3 years. This is a monthly payment, so the total number of periods you will get is 3 years x 12 = 36 months. So, nper is 60. These are the 3 required arguments of PMT function. And in cell C10, we have used the PMT function and got the value $332.14. The value is positive as I have used negative sign (-ve) before the PMT function. Otherwise, PMT function gives negative values. Now the enjoying part. I will show you how the whole thing actually works behind the scene. Think along with me. You will also enjoy this part. When you will make your first payment, you will pay the interest for 1 month (compounding interest) and some of the principal amount. One-month interest rate is 1% (bankers are clever, they divide the yearly rate by 12, so you have to pay higher than should pay). You’re paying $332.14 at the end of first period or month. So, you’re paying principal = $332.14 – $100 = $232.14. Then your new/residual principal will be = $10,000 – $232.14 = $9767.86. In the image, the value 9768 (rounded value of 9767.86) is showing in the cell G2 and the formula is showing on the right. When you’re making your second payment, you’re going to pay your interest based on the first-period-end principal amount and that is 9767.86. Your monthly payment is same and it is 332.14. See the following image. Also, take a look at the formula that I have used to get this value. Interest = C3, it denotes the monthly interest rate. Now we copy down these two formulas for the rest of cells in the column and we get the following result. Check all the iterations or the payment periods. You will find, in details, what is actually happening every period. We can use this formula in Excel to find the monthly payments. Check out the following image. In cell D7, we have used this formula: =(P*i)/(q*(1-(1+(i/q))^(-n*q))) and in cell D8, we have used this formula: =PMT(i/12,n*q,P,0,0). Both cells are giving the same results. PMT is giving negative value as it is cash outflow. But the numeric value is same. Let’s show you something different than so far, we have done. A little bit critical case. We cannot divide the interest rate by 12 when interest compounding is happening two times a year. If you do, you will pay more interest. For example, say we divide the interest rate 12% by 12 (=1) and calculate the interest for 6 months. But in our case, we should pay 6% after 6 months. Let’s use now the newly calculate interest rate (0.975879%) for this calculation. So, with the newly calculated interest rate, we are paying overall 6% interest rate at the end of 6 months. I hope this logic is now clear to you. And this is the solution. Except for the rate argument, (C2/2+1)^(1/6)-1, you can easily understand the other arguments. So, this part of the formula comes into this form: 06^(1/6) – 1 that results in the value 0.00975879. 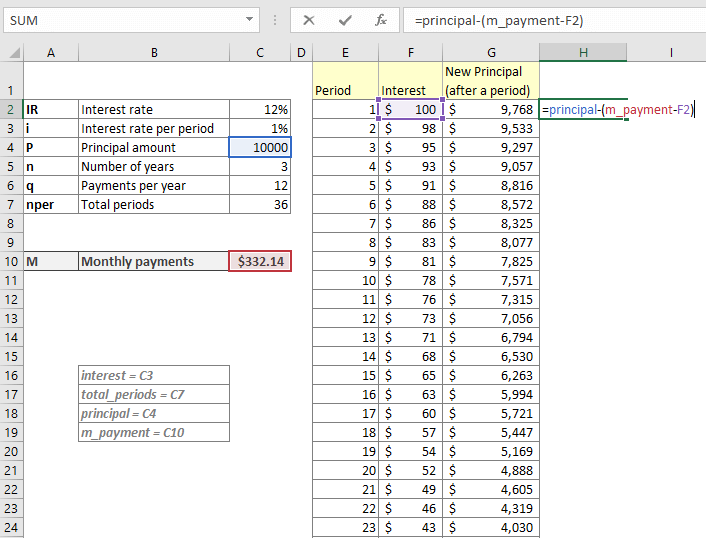 So, this is how you can calculate the monthly payments of a loan when the interest rate is compounded semi-annually. 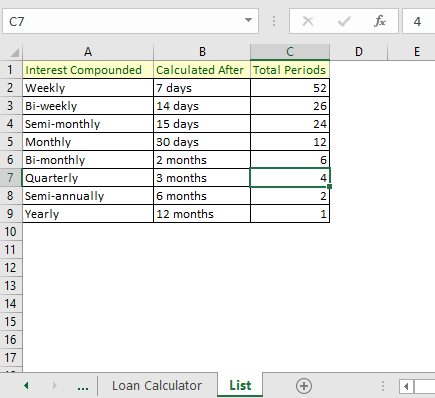 Using the above Excel calculator, you can easily calculate any kind of loan payment, it can be weekly, monthly, Bi-weekly, etc. We have used a VLOOKUP table like the following. This formula finds out the number of payments per year. The rest is simple. Just check out the file if you have already downloaded it from the download section. 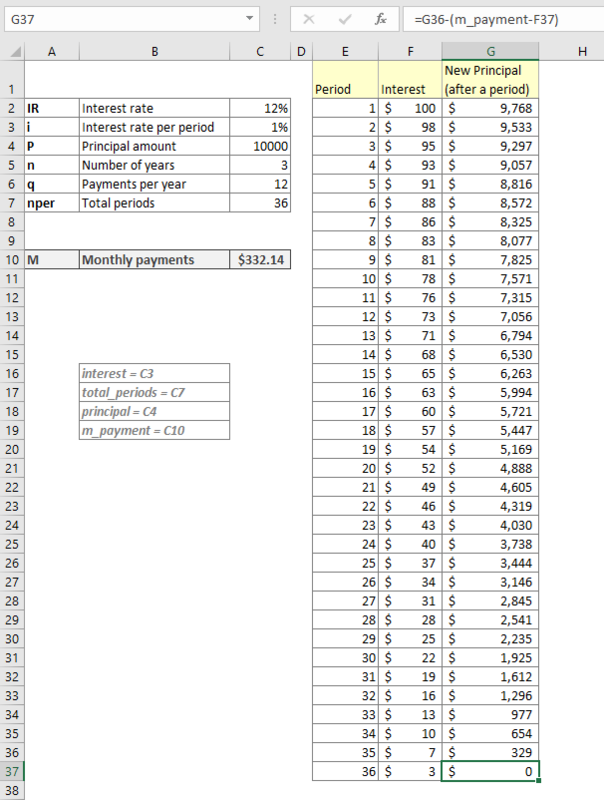 So, these are my ways of calculating monthly payments for loan taken for several years. If you have any feedback, please let me know in the comment box.